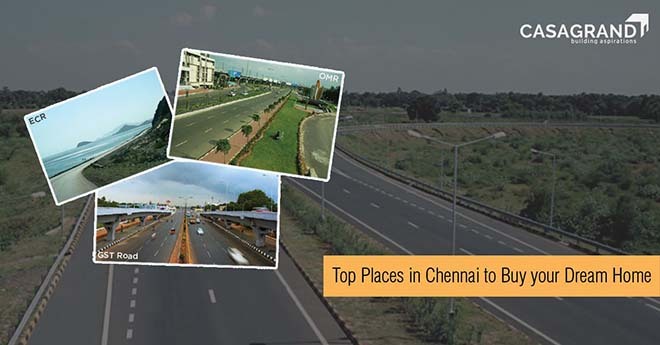 Be it for land or a business, Chennai is a fast moving and ever developing city. Chennaiites are known for their tendency to save and invest in land, making it the hub for builders and the location for constantly developing new projects. The transport, facilities, and booming industry make Chennai the perfect place for you to buy your dream home. Confused as to which would be the best location to do so? We bring to you a list of the top places in Chennai where you can buy your dream home. East Coast Road is one of the most cosmopolitan locations in Chennai. With its beautiful beachside view and serene pollution free environment, ECR is one of the best places to kick back and relax after a long day of work. It is well-connected to the prime localities in the city and is also one of the top educational hubs in Chennai as some of the top schools and colleges are located here. Furthermore, ECR is also one of the localities in Chennai that have the best entertainment centers. Apart from the beautiful beaches, ECR also has some of the best, suave restaurants and hang out spots. With a state highway that connects Chennai to Pondichery, ECR is in close proximity to both the cities. Take a short drive in the weekends and you can reach Pondichery in no time. Also, the Mahabalipuram group of monuments are close-by for an impromptu weekend getaway. What’s more? With Kovalam beach at close proximity, you can indulge in early morning water sports, like surfing, scuba diving, snorkelling, etc. that are a regular activity here. Our beautiful sea facing apartments in Casagrand ECR are a great investment opportunity. Old Mahabalipuram Road area is often referred to as the IT corridor of Chennai. With most of the automobile workforce and IT professionals residing in this area, it has become one of the most developed and flourishing areas in the city. Owing to this, it has stood witness to booming infrastructure and amenities, making it one of the most profitable locations to invest in. One of the major advantages of living in OMR is its close proximity to the various IT hubs. Also, OMR is well connected to localities like Mahindra World City, ECR, and GST. This neighbourhood houses some of the best, high quality educational institutions like National Institute of Fashion Technology (NIFT), SSN College of Engineering, Padma Seshadri School, D.A.V. CBSE School, etc. Furthermore, the international airport, Chennai is just 30 minutes away from OMR. Casa Grande projects in OMR include apartment style houses in Casagrand Ritz, villas in Casagrand Elan, and many more. The Grand Southern Trunk Road is one of the most well connected locations in Chennai, being one of the busiest highways in the city. A well-developed IT area, this is also one of the top residential locations in the city with shopping complexes, schools and supermarkets within a small radius. GST Road’s close proximity to Tambaram makes living in this locality a complete city experience. An amazing commercial hub with close proximity to Mahindra World City, Infosys, etc., this locality is also one of the best residential localities in Chennai owing to the growth of real estate in this area. Casagrand Tambaram is an exclusive apartments project at GST Road, Tambaram with premium amenities and features.